Recently, John Grezcula asked me if I’d like to contribute to the Round 2 Models blog. I’ve done some “around the edges” contributions previously, never anything like this though. I’ve been into model cars for as long as I can remember. I still have a few of my late Sixties builds; all of the survivors are AMT model kits–no surprise there, because they were my favorites back in the day. Besides collecting the kits themselves, I’ve gotten into other items relating to AMT and MPC car kits, particularly the catalogs. In the early Seventies, the original AMT company made their dealer catalogs available to the public. This was done via advertising placed in a couple of the 1:1 car magazines. I’ve held onto the catalogs that I sent for starting in 1975, when I first learned they were available. The occasional earlier catalog, foldout, or single-page sell sheet turns up on occasion, and I am fortunate enough to have located some of those. The old Auto World mail-order catalogs fill in the gaps where no AMT or MPC catalogs exist, or where I haven’t found them (yet!). Back in the day, it was nice to know what to expect in the way of new releases in the coming year, and when to start looking for them. Today, looking through these and the old Auto World mail-order catalogs, you can get a pretty good history of our corner of the model car hobby. Many of the AMT and MPC car kits we have looked forward to seeing again have been in and out of the lineup many times over the years, with changes in box art and the occasional parts alteration in order to appeal to new generations of builders and collectors. In some cases, you might not know how far back they really go. Here are a few pics of earlier issues of some current Round 2 AMT car kits. Next time, we’ll get into the particulars of one or two of them. First: AMT 25th Anniversary (1973) catalog illustration of the ’49 Ford and Mercury. 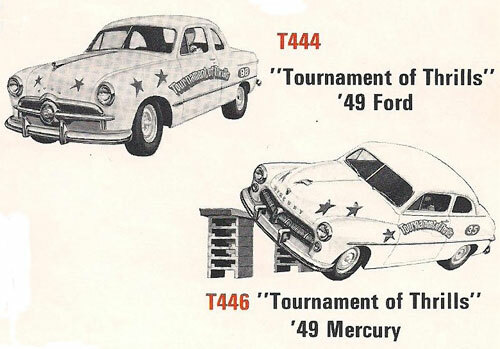 The Tournament of Thrills series included the 1950 Ford convertible also. An authentic set of thrill show jump ramps was included, but this issue saw the custom options deleted from all three kits. Future issues would see most, if not all, of the customizing options restored to these kits… just the way they should be! The ’49 Ford was first released in 1962 (though it doesn’t appear in the ’62 catalog). The ’49 Mercury first appeared in 1963. If there is a ’63 catalog, I’ve yet to see one. Second: The 1975 catalog saw both of these classic AMT kits returned to the lineup with the customizing parts restored and the thrill show ramps deleted. 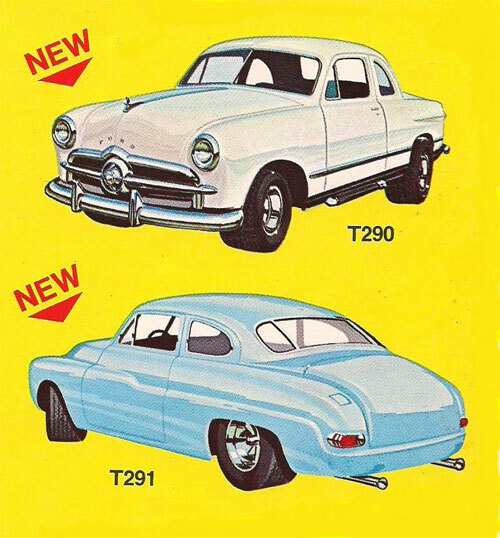 The catalog illustrations were often done quickly; note the similarity of the ’49 Ford to the earlier Thrill Show illustration! The Seventies-style side exhaust setup shown here did not make its way into any issue of the Ford. The Mercury illustration with the blue custom car was never used on any kit box, and shows the Merc with mag wheels that were never in any issue of the kit. Third: The 1971 catalog shows a partial selection of AMT’s dragster kits. Of the four shown, three are currently available from Round 2, and the fourth was reissued a number of times and can still be found. Though the nostalgia craze had not yet caught on with drag racers, the Double Dragster was still hanging in there. 1971 would mark its final appearance in an AMT catalog… until now, of course! This entry was posted on Tuesday, September 14th, 2010 at 5:27 pm	and is filed under AMT, Round2 Models. You can follow any responses to this entry through the RSS 2.0 feed. You can skip to the end and leave a response. Pinging is currently not allowed. Fascinating stuff — I love “obscure” info like this. Makes me want to buy more kits! Another odd little catalog moment was AMT’s announcement of a reissue of the 1969 (or they call it a 1970?) Impala in the ’75 or ’76 catalog. The illustration shows a customized 1969 Impala front end, but of course the 1970 “Heavy Chevy” was the actual release. I remember building a couple of those Tournament of Thrills kits when I was a youngster, and playing with them in the basement of our home. I am not sure, but the kits might have used metal axles? If so, that was probably why I liked them so much, you could not only build them, but play with them like a toy car with the ramps as well. So any info / updates as to the Star Trek kits being pushed back on their release dates? Hopefully so they can add those aztec decals. I too am an avid AMT model collector and have many of my original 3-n-1 models from the 60’s and 70’s still in my collection today. I also still have many of my original AMT catalogs and flyers from the early 70’s and of’course a few of the original Auto World catalogs from the late 60’s that I sent away for. I ordered a lot of my AMT kits from those catalogs back then. I’m currently building a new model room and will have these old Auto World catalogs/ AMT flyers framed and hung from the walls. AMT has been a big part of my life. Thanks for the fond memories. Kenny. P.S. How about bringing back “The Kat” from AMT ??? Kenny, “The Kat” is already back – a decal of him was included in the ’62 Buick kit and he’s appeared on many decal and instruction sheets. He will make other appearances in more ways as things progress! Thanks for your support. either full and extended cabs, 04 Chevy Silverados and Dodge Dakotas etc, these have been absent from models as many of us own one of these it would be fun to have one to model. Hey guys, i would like to add that in this day and age of transport hardship and economical seesawing, iv found myself progressively feeling more guilty about the expense and materials used in my modeling, and as such have only ever bought 3n1, 2n1 or any expanded kits with extras, as a buying modeler this allows me to walk out of the hobby shop with a little box of potential and options, it feels like value for money, and will bring me back for more. As a truck modeler, personally i would love to see a return of tyrone malone’s kenworth aerodyne hide out truck and Bandag Bandit kenworth or the Kenworth Aerodyne Papa Truck and Kenworth Super Boss as a combo kit both trucks one kit……one can dream. Thanks for your comments, if you sent an email into us, I think I may have replied.